Are you disturbed by all of the additives, preservatives and flavor enhancers lurking in our food? Want to get back to eating REAL food, instead? I’ve spent years researching how to avoid chemical additives and learning how to create natural recipes that are simple and delicious! And I’ve created this book to share with you all of the recipes and shopping guidance you need to prepare simple natural foods your whole family will love. 160 delicious natural recipes that even the kids will enjoy! Ingredients that come from plants and animals…not chemical labs! 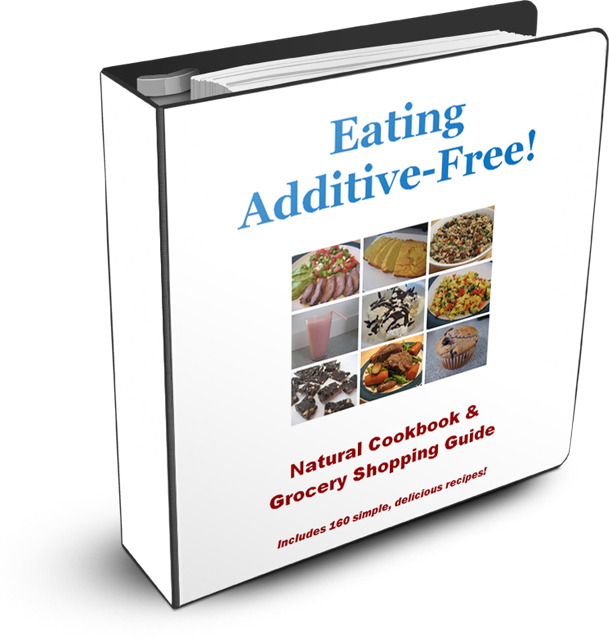 40-page grocery shopping guide to help you select the most additive-free versions of every ingredient used in our recipes! Hundreds of product selection tips based on years of investigating the food industry’s sneaky tactics! Suggestions for specific brand names and retailers to save you all sorts of label-reading time at the grocery store! Wanna peek inside my book?! Click here for a preview! There’s no risk in purchasing my book because your satisfaction is guaranteed! Simply contact me within 30 days of purchase for a FULL refund if you are not 100% satisfied – – no questions asked! This electronic version is an instant download pdf that is fully printable! You and your taste buds are gonna LOVE this book! And you won’t believe all the time and energy it saves you! But don’t take my word for it…click here to see what my happy customers have to say!